Tonight, Monday, May 2, the band will be in Austin, MN, home of a certain food company that is dear to our hearts. 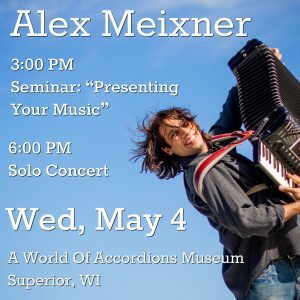 And then on the 3rd, the band will be doing an educational clinic and concert in Minocqua, WI before Alex heads over to Superior, WI for a solo clinic and concert at Helmi Harrington’s A World of Accordions Museum on Wednesday, the 4th. If you’re anywhere near there, please make plans to support all of the great programs Dr. Harrington is offering. We also have a concert in Ely, MN, the first time I’ve been up on the Iron Range in years, most likely since the old Ironworld Polka Festivals. Hope to see some old friends up there as well as in Hutchinson, MN before we head off to new venues in Lisbon, ND, and Anaconda, MT. Hope the weather is warming up for everyone and that we get to see you soon!